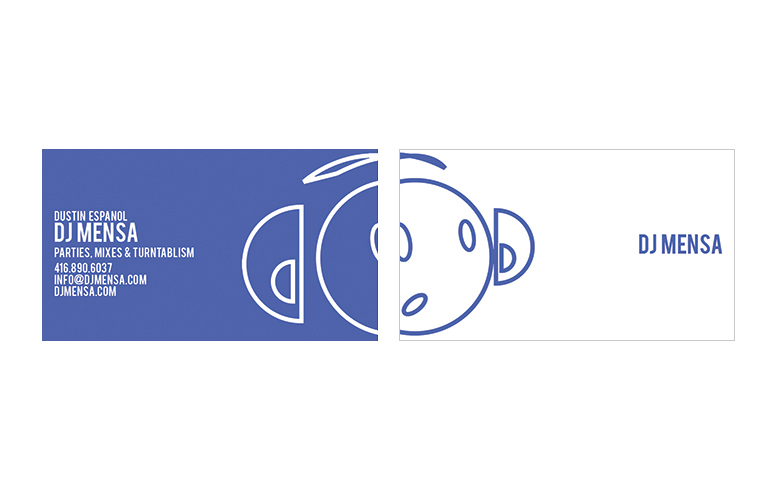 An identity for Toronto based 'King of The Coolout', DJ Mensa. 'It's Mixed By DJ Mensa Man!!!' stemmed from a simple saying on one of DJ Mensa's mixtapes. It eventually landed onto the back of numerous promotional flyers and onto a t-shirt design as well. A promotional flyer for Mensa's weekly residency - 'Social Experiment' celebrating another year of birth for our good friend, Taurean Scotland. DJ Mensa contacted us to deliver a flyer that was based on the movie 'Nick & Norah's Infinite Playlist' seeing as for one night, Taurean would be selecting a playlist while Mensa played his musical puppet on two turntables. 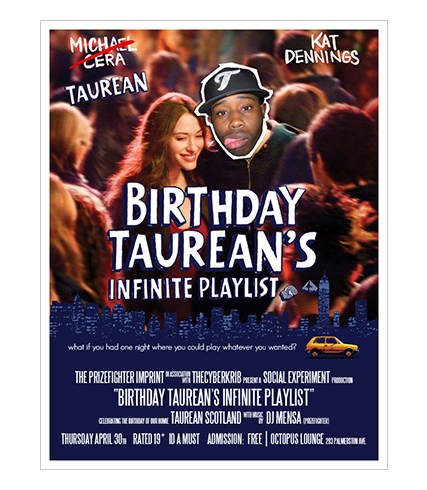 I decided to flip the movie poster, taking Michael Cera out of the mix and making Taurean the lead role. Can't get a better birthday than that! A promotional flyer for a one off party, In Bloom. We've had our fair share of rain this past April and it's only right that we not only usher in Spring with a bang, but we also celebrate a few blooming birthdays along with it too! Mensa mentioned that this party was in celebration of a friend of his, and that she was a 'girly girl' (which may or may not be verbatim). I decided to keep it real clean for the ladies on this one. The ladies like soft tones right? Flowers? Maybe even clean typefaces perhaps? Well, that's exactly what we gave them! 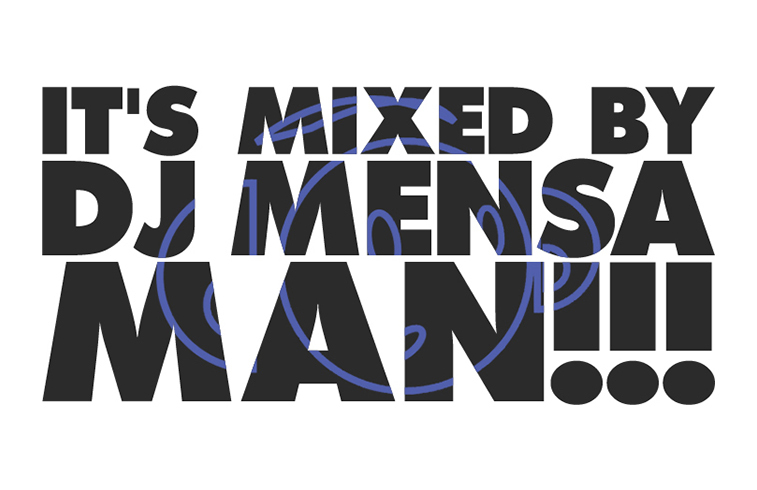 The official online home of DJ Mensa. 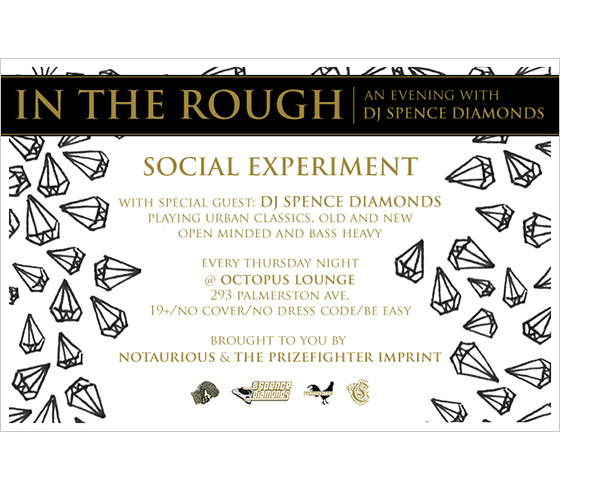 Launched in conjunction with the One Year Anniversary of DJ Mensa's weekly Thursday residency, Social Experiment, things just couldn't be more right. We originally started this project around March of 2009 I believe. 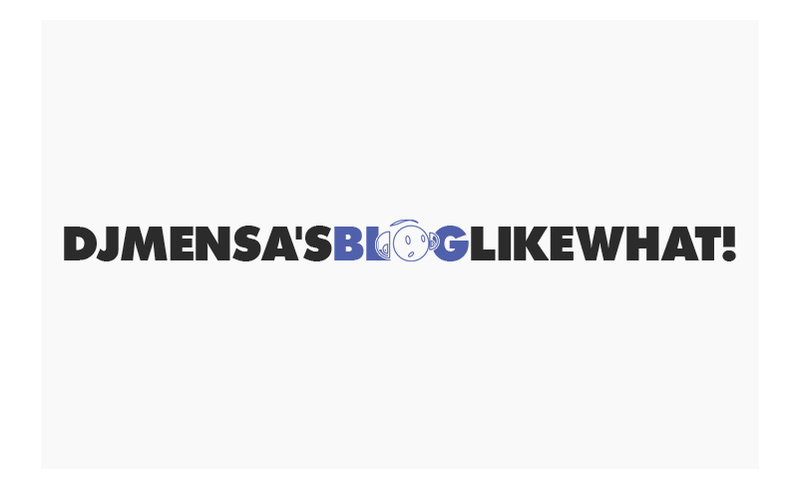 With an existing blog that utilized the default wordpress theme, Mensa was going through a transitional stage. Doing away with his original logo and wanting to re-brand himself. With that said, we decided it was time to revamp everything. A new logo was in the works, and it was only a matter of time before his online presence was revamped as well. We sat on the project for a couple months, constantly re-working the layout and the functionality until we found something that we could both stand behind 110%. 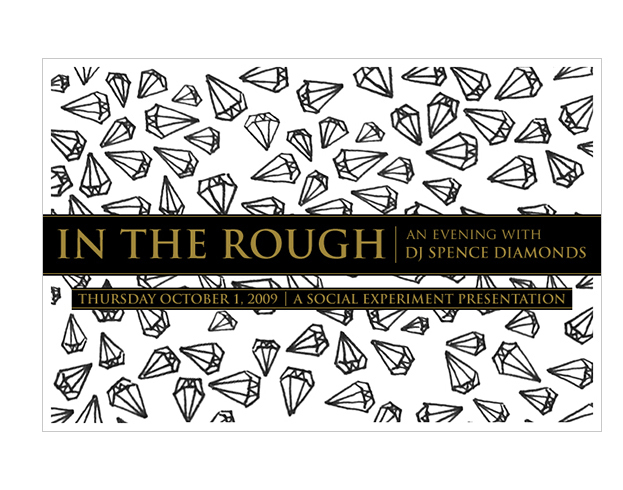 With Mensa out of town tending to some Red Bull Toronto 3Style Champion duties, Spence Diamonds was given the task of holding it down at Social Experiment, and I was dealt the task of creating the flyer. The use of diamonds were a must here, and I kept it simple with a drawn out pattern, and the use of black and gold to give it that little pop. I've been doing rush jobs for Mensa for as long as I can remember, and I'm pretty sure this one had the tightest deadline of them all. With a little over an hour to work with, my main concern was to deliver something simple yet also attention grabbing. With the use of two eye grabbing colors and clean lines, I think we achieved that well. A promotional flyer for a Prizefighter + Grand Groove special presentation, Brand New Funk! Brand New Funk! is a celebration of the unfamiliar, the road less travelled, and the forgotten but not yet gone. In classic Mensa fashion, I get a last minute go-ahead for an event that would introduce Washington D.C.'s DJ Quartermaine aka Supa Qool Uncle DJ Q to the city of Toronto. Hailing from the same camp that brought us Kev Brown, PMD aka Peter Rosenberg, Kenn Starr, Oddisee and more, DJ Quartermaine gained a cult following with his tribute mixes to Raphael Saadiq, Maxwell, Erykah Badu, and Lenny Kravitz. With a tight timeframe, I opted to go with a bright palette and a clean layout. We originally didn't have any workable images from Quartermaine (sadly), but with a little sleuthing I managed to find one last minute to include on the final flyer. Overall, pretty happy with the way it turned out. Mensa contacted me asking me if I'd be able to whip something up for his latest mix cd and I of course obliged. Feeling a bit stuck on ideas after being on a slight design hiatus, I originally had a more illustrated design mocked up. While it fit the 'Hibernation' theme in words, it unfortunately didn't feel like 'Hibernation' to me. It's a mellower R&B mix filed with soft keys, warm bass, and a whole lot of intimacy. With that in mind as the focal point, I went back to the drawing board and came up with this frosted snowflake/glass theme. Much more vibe appropriate, and just what he had in mind. 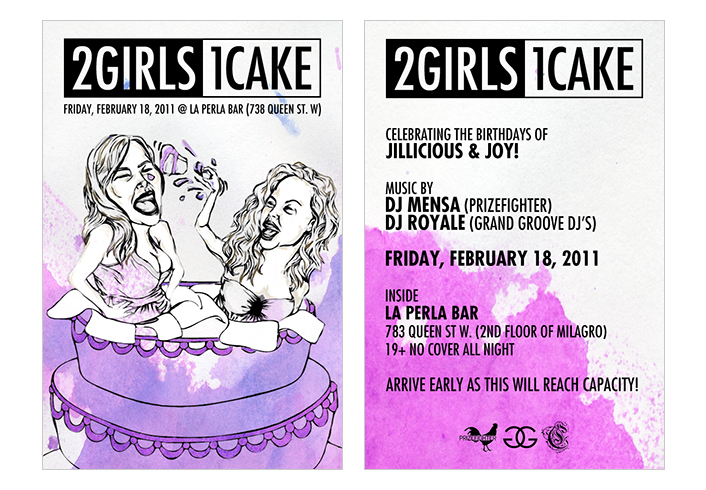 A promotional flyer for the third annual '2GIRLS1CAKE' party/birthday celebration. 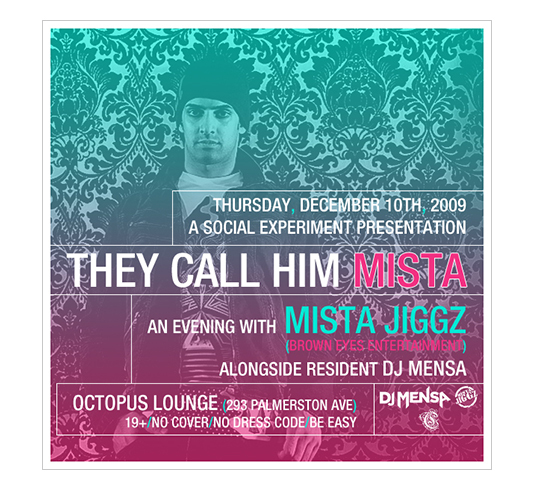 As always, Mensa needed this flyer done up asap, and I came through with this. Without the original caricature file to work off of, I basically reworked the one that was used for the prior 2 incarnations of the party, meticulously re-coloring certain elements and throwing in some new ones of my own. What was once a black based flyer with green/blue/orange thown in the mix, was re-done in a brighter tone of white, purples and pinks. I decided to incorporate parts of the watercolor background into their dresses, while adding subtle flesh tones and browns into the caricature as well. All in all, a simple yet eye catching flyer that I'm extremely happy with. 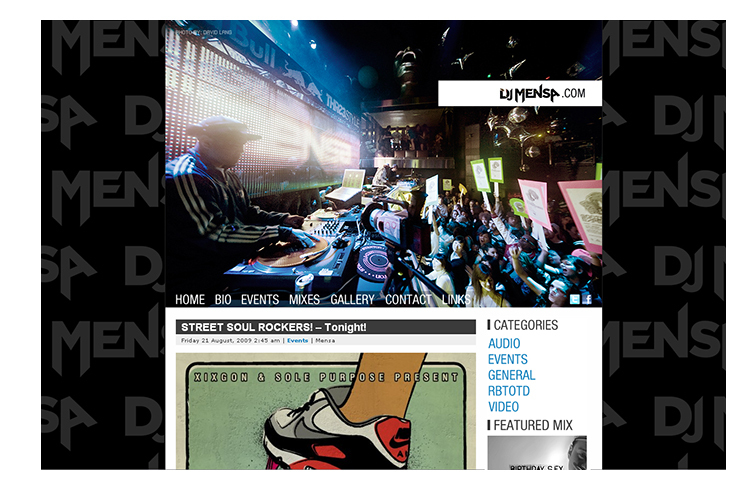 Artwork for DJ Mensa & DJ Royale's 'Quintesstial Pre-Party Mix' cd series, 'Steppin Out'. The premise of this set of mix cd's is that it captures that vibe during a DJ's opening set - think 10:30-11:30 on a Friday night, the time when you would hear the DJ warm up and break those new records that were given out on 12" promo vinyl to select DJ's, or those songs that you heard on some mixtape you had to dub from a friend of a friend in order to even hear the tune. This is the 90's before everything was easily accessible. I wanted to capture that feeling of hearing those classic 90's mixtapes and not knowing who or what artist I was listening to. Even to this day, I get that feeling from hearing an old Ron G. mix.